Check out this awesome video of Phil Soltysaik ripping it up in Sherkston, on the Eastern end of Lake Erie. Aside from he fact that hes ridding with the sail number I used to race with, he is destroying it! And representing Canada well on the PWA with a recent finish of 6th overall on the PWA! This video is awesome and really shows how sweet big lake sailing can be. Phil Soltysiak rips Sherkston… a cool spot at the eastern end of Lake Erie. Enjoy this sweet video from the Gorge Jump off, brought to you by the guys from Epic sessions and Windsurfing Magazine. If you’re not familiar with the Jump off format, basically riders throw down the biggest aerial maneuvers they can. The Shadowbox records and measure the height, speed and rotation of the aerials. Who wins? Whoever goes biggest! And you got to stick that landing. Enjoy! Full results and even more awesome videos can be found on EpicSessions.tv. So check it out! 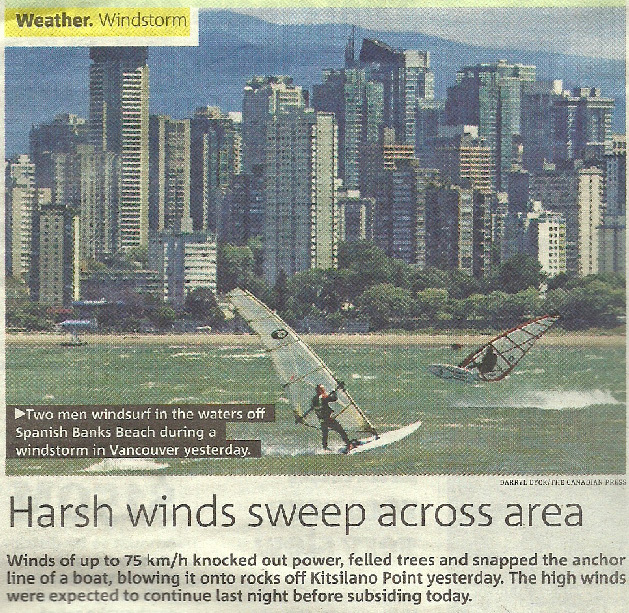 Monday July 12th Vancouver was rocked with some awesome wind. Tons of windsurfers hit the water and had a blast. Check out the Article from the paper of the two unidentified sailors ripping it up, and the crazy graphs from Iwindsurf and Jerichowind. Continue reading to check out the crazy wind graphs.